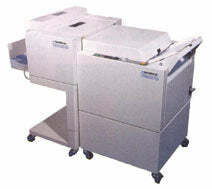 The plockmatic 60 is a powerful extremely quiet and compact automatic booklet-maker for fast production of booklets. Ideal for producing A3 to A4, A4 to A5 an A5 to A6 size booklets. Simply insert the sheets and the Plockmatic 60 will automatically put two staples in and then fold the booklet. A powerful and extremely quiet booklet-maker. A5 to A6 size, A4 to A5 size, A3 to A4 size booklets. Auto cycle. Up to 88 page booklets. Up to 1800 booklets per hour. Also available Plockmatic 61, the on-line version to link with collator. On or off-line version, with side jogger, will link to Plockmatic collators. For A4 and A5 size booklets.